Today was our last full day in Prague. Determined to find a geocache after failing miserably last time we visited, we decided to head off to the John Lennon wall. The wall is an odd attraction. Lennon was never at the site where it stands, in fact he never actually visited Prague at all. The wall came to be known because of what the grafitti painting of Lennon’s face represented: the values of peace and unity. Today the original artwork is long gone but the wall is covered in bright coloured messages of Love, Peace and Beatle’s lyrics. After admiring the wall, leaving our mark, and finding the well-concealed cache, we set out for a wander around what felt like a very different Prague the city we visited back in April. As it’s now winter, the temperatures are below zero and the tourists are few. It’s nice to feel like we have the city to ourselves, but boy is it cold. Most of today was spent on the bus from Berlin to Prague, via Dresden. I was worried that so much time on a bus would become tedious but as it’s around 0-2° in most places, the warmth of the bus is a welcome relief. The stop in Dresden was odd as it appeared the only people in the town were on our Contiki tour! I guess everywhere is just much quieter during winter. The stop was short and before long we were in Prague. After a quick freshen up we headed out for our Prague welcome dinner and then far too many drinks for me to continue writing this post. After a hard night out, we decided it best to sleep off our hangovers and skip the walking tour. It should probably be noted at this point that Contiki has certainly lived up to it’s heavy drinking reputation – providing free booze with every included dinner. It’s been 6 months since we were last in Prague so the sites on the tour are still fresh in our memories. We decided instead to take the tram and meet up with the rest of the tour for our lunchtime boat cruise and then on to a spot of shopping. The tour so far has been very sobering as we’ve been learning about the suffering many people experienced in Berlin during the World Wars and particularly during the National Socialist period. Today Contiki had arranged a morning walking tour with an English speaking guide. He took us past several sites we’d already seen but then on to a few that we were unlikely to have found ourselves. 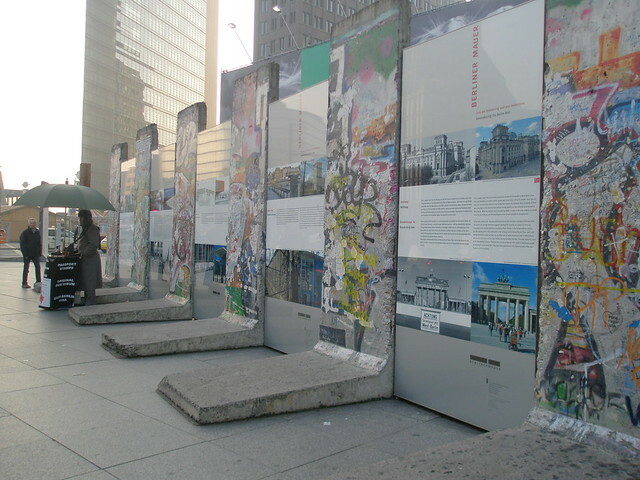 The highlights were: the location of Hitler’s bunker where he died (disappointingly it has been destroyed and is now just a carpark), the Brandenburger Tor (Brandenburg Gate), and of course the last remaining piece of the Berlin wall. We stumbled across a winter market serving German style mulled wine and an array of snacks. I tried Kartoffelpuffer which is essentially fried potato cakes smoothered in apple sauce. The market had a artificial hill for inner-tube rides so we had to give that a go despite freezing our pants off already. It was a heap of fun but sadly we were sliding too fast for any decent photos. Today we visited the Sachsenhausen Memorial and Museum. Its taken me a little while to write this blog post as it’s just so difficult to decide what to say about such a horrible place. I’ve heard stories about what went on in concentration camps but being there and seeing the grounds for myself just made the stories so much more chilling. After a 2 hour sobering visit, we ventured into the city to learn more about Berlin’s checkered past. 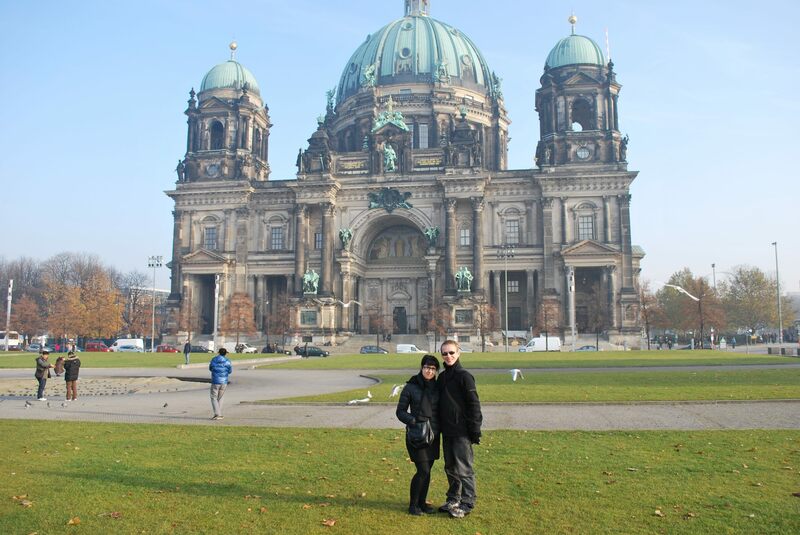 Given free time in the city, Phil, Steve, Fiona, Jason and myself decided to visit the Berliner Dom – a large cathedral in the center of town that was built around the turn of the 20th Century. The inside was beautiful (as many cathedrals that we’ve visited during our time in Europe) but it was the access to the top of the building that made it the most memorable. A few flights of stairs up we exited the outside of the dome and were treated to a beautiful view of Berlin from above. As the sun set and the temperatures reached below zero, we headed back to the hotel and dressed up warm. We jumped back on our trusty Contiki bus to meet a local guide and learn about the Berlin wall. The site we visited was home to the infamous tunnel 57, named as such to record the number of people that managed to escape to the West one fateful night. 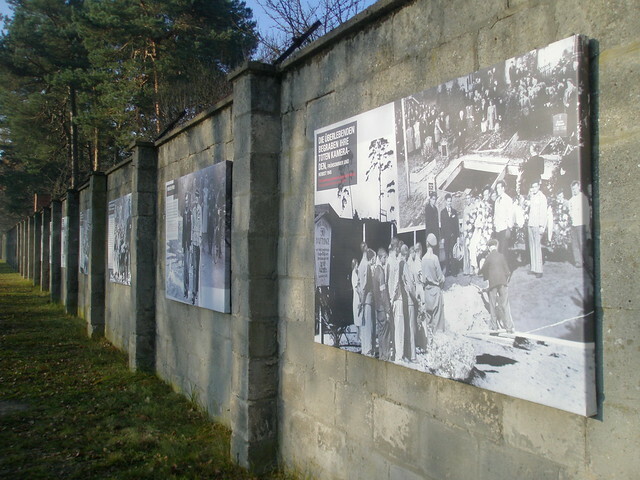 Despite the successful escapes of some, most failed in their attempts to reach freedom from the Soviet-run East, and were captured or shot. The site remains a place of great sadness with a memorial to remember those that fell, including a memorial for one particular man who jumped from a 4 storey building only to miss the ‘catching blankets’ being held for him down below. We learnt from our guide about ‘dead letter drops’ – a technique used by people to communicate without the Stasi (secret police) being able to interfere. We played a fun little letter hunting game to find the pub we would be drinking at and the rest of the night was dedicated to drinking. After an early start on Saturday, we said our goodbyes to London and departed Heathrow for Berlin. We checked into The Grand Hotel and after settling in, went down to the function room to meet up with our tour group. Our guide, JB, gave us the low down on how the tour would work and explained the optional activities for the next couple of days in Berlin. 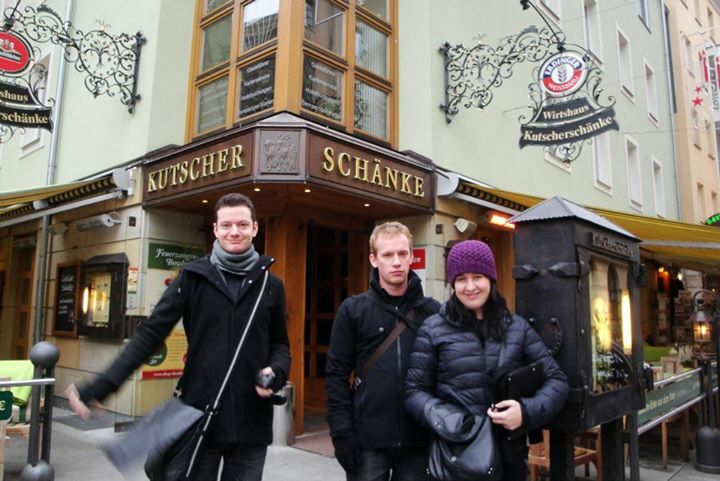 They included a walking tour and a pub crawl – both of which we’ve opted to do so watch this space. Afterwards we went out for dinner – a great chance to meet & mingle with the 48 other people in the group. Phil and I stuck to standard meals & beer while Steve went experimental and tried the ‘Beer with Banana Juice’. It looked like a smoothie but wasn’t half bad! 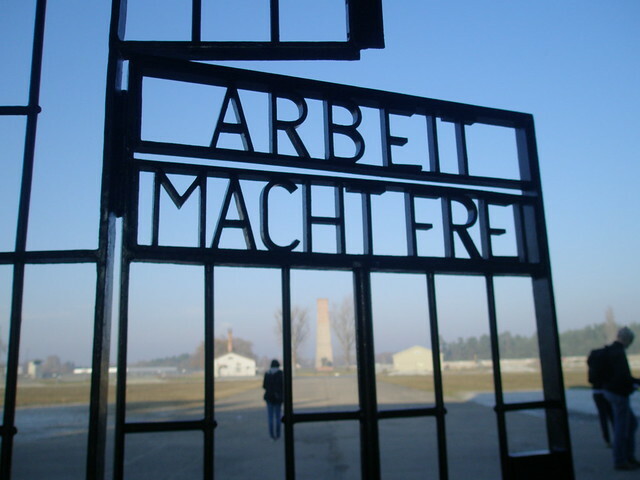 Tomorrow we’re departing the hotel at 9am to visit the Sachsenhausen Concentration Camp which we’re expecting to be quite a sobering experience. Posts on this blog are from both Phil and myself as we make our way around the world. Current Location: Wellington, New Zealand.